Baring-Gould, Sabine, M.A., eldest son of Mr. Edward Baring-Gould, of Lew Trenchard, Devon, b. at Exeter, Jan. 28, 1834, and educated at Clare College, Cambridge, B.A. 1857, M.A. 1860. 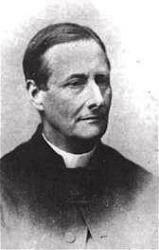 Taking Holy Orders in 1864, he held the curacy of Horbury, near Wakefield, until 1807, when he was preferred to the incumbency of Dalton, Yorks. In 1871 he became rector of East Mersea, Essex, and in 1881 rector of Lew Trenchard, Devon. His works are numerous, the most important of which are, Lives of the Saints, 15 vols., 1872-77; Curious Myths of the Middle Ages, 2 series, 1866-68; The Origin and Development of Religious Belief, 2 vols., 1869-1870; and various volumes of sermons. His hymns, original and translated, appeared in the Church Times; Hymns Ancient & Modern, 1868 and 1875; The People's Hymnal, 1867, and other collections, the most popular being "Onward, Christian soldiers," "Daily, daily sing the praises," the translation "Through the night of doubt and sorrow," and the exquisite Easter hymn, "On the Resurrection Morning." His latest effort in hymnology is the publication of original Church Songs, 1884, of which two series have been already issued. In the Sacristy for Nov. 1871, he also contributed nine carols to an article on "The Noels and Carols of French Flanders.” These have been partially transferred to Chope's and Staniforth's Carol Books, and also to his Church Songs. 1. Forward! said the Prophet. Processional. Appeared in the New Mitre Hymnal, 1874. 2. My Lord, in glory reigning. Christ in Glory. In Mrs. Brock's Children's Hymn Book, 1881. 3. Now severed is Jordan. Processional. Appeared in the S. Mary, Aberdeen, Hymnal, 1866, the People's Hymnal, 1867, &c.
Rev. Sabine Baring-Gould (28 January 1834 – 2 January 1924) of Lew Trenchard in Devon, England, was an Anglican priest, hagiographer, antiquarian, novelist and eclectic scholar. His bibliography consists of more than 1240 publications, though this list continues to grow. His family home, the manor house of Lew Trenchard, near Okehampton, Devon, has been preserved as he had it rebuilt and is now a hotel. He is remembered particularly as a writer of hymns, the best-known being "Onward, Christian Soldiers" and "Now the Day Is Over". He also translated the carol "Gabriel's Message" from the Basque language to English.